First game in group C that is about to be played is France vs. Australia. This game is also good candidate to put our bets and earn some cash. These two teams played three times in last eleven years and Denmark collected two wins and one defeat. Last time they played six years ago and Denmark defeated Australia 2:0. First round has passed and Denmark is in second place with three points. Their opponent was Peru and they were undefeated in seven matches before the start of World Cup. Peruvians countered Danish 4-3-3 with rock solid 4-2-3-1 and in first half we had an impression that Peru was slightly better. Luck was on Danish side when Peru missed the best possible chance to score when referee awarded penalty. As it usually happens one must be punished for such miss. In fifty-ninth minute, RB Leipzig’s striker Yussuf Poulsen scored what turned out to be winning goal 0:1. In last five games that Danes played, there were under 2.5 goals and we are certain that Denmark will pay special attention on defensive tasks because by some statistics they may need only one point in next two games to reach second phase. We expect to see firm defense and quick counter attacks by Danes, basically exactly what weÂ’ve already seen against Peru. A lot of people see Australia as wannabe football nation and as someone who should stick to rugby. Truth is little bit different. Since the beginning of new millennium Australia improved significantly. Before the match with France, Socceroos as theyÂ’ve been popularly called lost only two of their last ten matches. Australia opted for stable 4-2-3-1 system. After goalless first half of the match, ref decided that the time for goals has come. In fifty-eighth minute France earns penalty and result is 1:0. Only four minutes later Australia is given chance to equalize after penalty and they did 1:1. The scorer was Mile Jedinak. Australian player, Aziz Behich scores tremendous goal in eighty-first minute but unfortunately he scored own goal 2:1. After initial defeat, Australia must win both remaining games to secure place in knockout phase. First one is against Denmark and it will be tough because Danes kept their sheet clean in last five games. Enjoy in great football match Denmark vs. Australia and try to earn money with our football prediction and betting tips. Read our betting preview and take your chance to win a big. Denmark donÂ’t have big injury concerns before the match against Australia, but they donÂ’t have all players available for this game. William Kvist is injured and he canÂ’t play on Thursday. Andreas Christensen is not fully fit and he is doubtful for the match. All other players are fully fit and ready to play. On the other side Australia have all players available for the match and all of them are eager to pick up some points on the Matchday Two. We expect one tough football game with lots of midfield duels and fouls. Both sides like to play strong and aggressive football and we donÂ’t expect lots of scoring chances and goals. This is an important game for both sides and they will play very cautious. A win for Denmark would all but secure a place in the knockout round and they are highly motivated for the match. On the other side Australia were beaten 2-1 by France in their opener and now this game is going to be a must win for them. The Socceroos played very well in first round and now they are in full of confidence. Australia showed it can match up with the best as it prepares to face Denmark in Samara on Thursday and they will try to pick up all three points here. It will be their main objective for the match and they will do their best on Thursday. 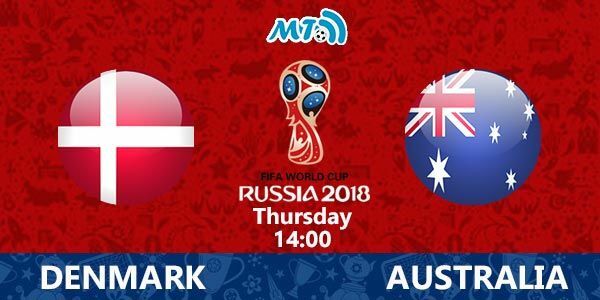 Our prediction and betting tips for the match Denmark vs Australia Prediction: Under 2.5 goals. We donÂ’t expect lots of scoring chances on this match and our second betting pick is 1HT Draw. We donÂ’t expect to see goals in first half time. Both sides have a chance to win all three points here and they will try to do that in 2nd HT. We expect to see exactly one goal in second halves and our betting pick goes on correct score 0-1. Have a nice betting day and good luck in earning money with our football prediction and betting tips. A Â£100 Bet on Australia to win 1-0 returns Â£1100. Click here!